Will the aluminum pan and foil give you Alzheimer’s? Aluminum (or aluminium) is a silvery metal that is both ductile and light. It is abundant in nature. These characteristics make it a favorite in many industries. Food utensils, such as pans and pots, are often made of aluminum. This use is dwarfed by aluminum’s widespread use in the canning of foods and drinks (e.g., sodas and beers). Based on a systematic literature review published in 2008, Ferreira et al. argued that there is credible evidence of an “association” between Alzheimer’s disease and aluminum intake (). This argument has been challenged by other researchers, but has nevertheless gained media attention. Positive and negative associations will always be found where there are nonzero correlations, but correlation does not guarantee causation. A research report commissioned by the U.S. Environmental Protection Agency, authored by Krewski et al. and published in 2007, reviewed a number of studies on the health effects of aluminum (). Several interesting findings emerged from this extensive review of the literature. For example, a targeted study published in the late 1980s and early 1990s suggested that the daily intake of aluminum of a 14-16 year old male in the U.S. was about 11.5 mg; the main sources being additives to the following refined foods: cornbread (36.6% of total intake), American processed cheese (17.2%), pancakes (9.0%), yellow cake with icing (8%), taco/tostada (3.5%), cheeseburger (2.7%), tea (2.0%); hamburger (1.8%), and fish sticks (1.5%). The meat that goes into the manufacturing of industrial hamburgers is not a significant source of aluminum. The same goes for the fish in the fish sticks. It is the industrial refining that makes the above-mentioned foods non-negligible sources of aluminum. One could argue that processed cheese should not be called “cheese”, as it is far removed from “real” cheese in terms of nutrient composition – particularly aged raw milk cheese. Aluminum-treated water is widely believed to be a major source of aluminum to the body, with the potential of leading to health-detrimental accumulation. It appears that this is a myth based on several of the studies reviewed by Krewski et al. One study concluded that humans drinking aluminum-treated water over a period of 70 to 80 years would have a total accumulation of approximately 1.5 mg of aluminum in their brain (1 mg/kg, the average adult human brain weighs 1.5 kg). At the high end of normal levels, and not much compared to the 34 mg found in some of those exposed to the Camelford water pollution incident (). And here is something else to consider. The study made two unlikely assumptions for emphasis: that all the ingested aluminum was absorbed, and that those exposed suffered from a condition that entirely prevented excretion from excess ingested aluminum. Krewski et al.’s report and virtually all empirical studies I reviewed for this post suggest that the intake of aluminum from cooking utensils is negligible. Is aluminum intake via food additives, arguably one of the main sources for most people living in urban environments today, likely to cause neurological diseases such as Alzheimer's disease? My review of the evidence left me with the impression that most of the studies suggesting that aluminum intake can lead to neurological diseases make causal mistakes. One representative example is Rifat et al.’s study published in 1990 in The Lancet (). 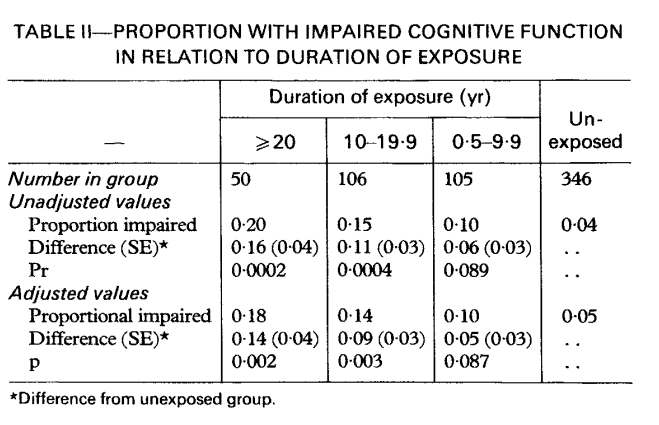 This old study is interesting because it looked at the effects of ingestion of finely ground aluminum between 1944 and 1977 by miners, where the aluminum was ingested because it was believed to be protective against silicotic lung disease (caused by inhalation of crystalline silica dust). As a side note, I should say that the intake levels reported in Rifat et al.’s study seem lower than what one would expect to see from a modern diet of refined foods. This seems odd. The levels may have been underestimated by Rifat et al. Or, what is more worrying, they may be quite high in a modern diet of refined foods. 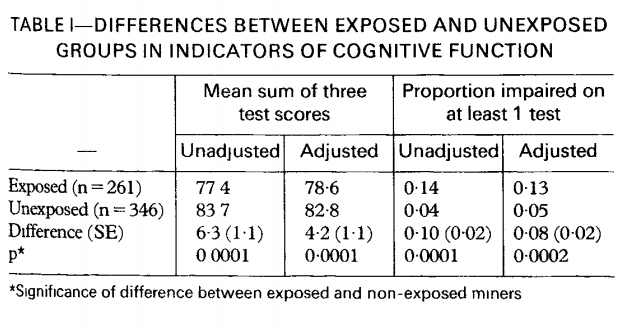 Having said that, Rifat et al.’s article reports “… no significant differences between exposed and non-exposed miners in reported diagnoses of neurological disorder …” However, the tables below from their article show significant differences between exposed and non-exposed miners in their performance in cognitive tests. Those exposed to aluminum performed worst. Two major variables that one would expect Rifat et al. to have controlled for are age and lung disease. 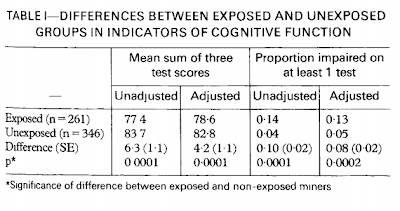 They did control for age and a few other factors, with the corresponding results indicated as “adjusted” in the tables. However, they did not control for lung disease – the very factor that motivated aluminum intake. Lung disease is likely to limit the supply of oxygen to the brain, and thus cause cognitive problems in the short and long term. 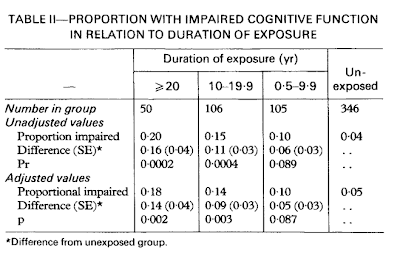 Therefore, the cognitive impairments suggested by Rifat et al. 's study may have been caused by lung disease, and not by exposure to aluminum. This type of problem is a common feature of studies of the health effects of aluminum. Will cooking in aluminum pans and aluminum foils give you Alzheimer’s? I doubt it.